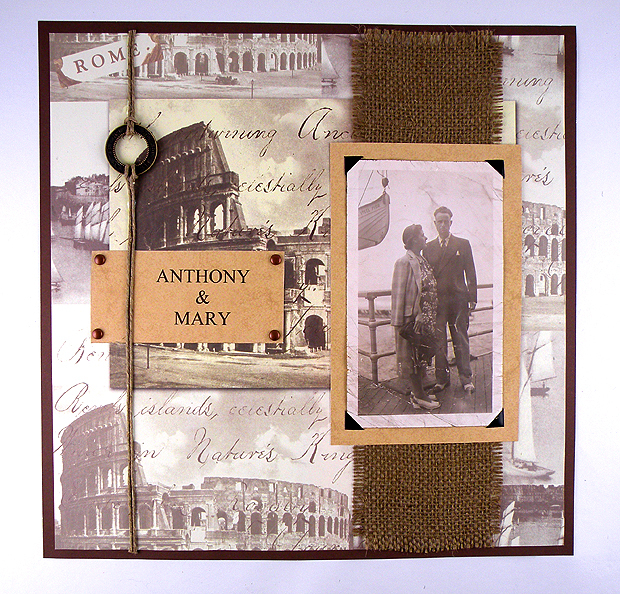 I don’t tend to scrapbook very often even though I love scrapbooking paper and use it in a lot of my designs. When I was asked by Scotch to create a scrapbooking page for their website, I decided to create a very simple design but it also has the style and feel I wanting to achieve. I had an old picture of my grandparents who are from Italy so I wanted to play up their heritage with natural elements and earth tones. I gave it an old world look that complimented the aged look of the photo. Trim the old world patterned scrapbooking paper so it measures 11-1/2 x 11-1/2 inches. Apply strips of double-sided tape to the wrong side of the top, bottom and sides of he brown textured scrapbooking paper and attach it to the center of brown mounting paper. Cut a piece of the beige marbled cardstock 1/2 inch larger than the length and width of the size of the picture. 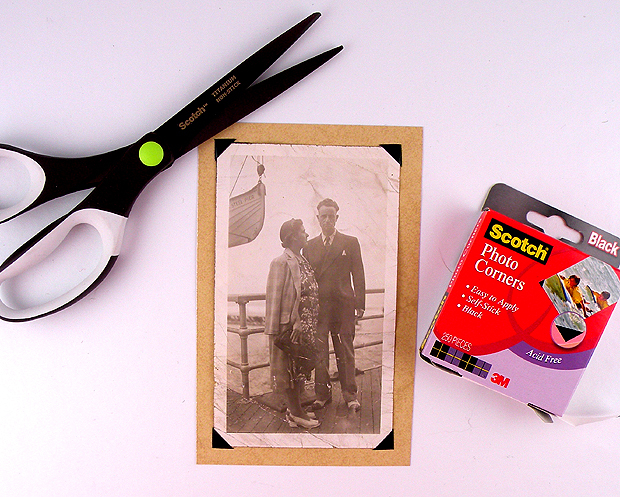 Slide a photo corner on each of the corners of the picture and attach it to the center of the cardstock. 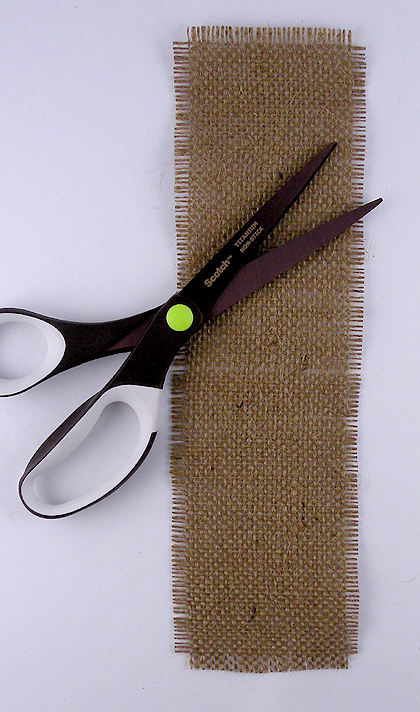 Cut a piece of the burlap 11-1/2 inches wide and 1 inch smaller than the width of the photo. Fray 1/2 inch of the edges on all sides. Apply strips of tape to the wrong side of the top, bottom and sides of the burlap and attach it to the page about 1-1/2 inch from the right edge and lined up with the top and bottom edge of the scrapbooking paper. Add a small amount of craft glue to the wrong side of the photo and attach it to the burlap, centered between the top and bottom edges of the page. Print the title onto the beige marbled cardstock. Cut out the label so it measures 4 inches x 2 inches and it is off centered 1 inch from the left edge. Apply strips of tape to the top, bottom and sides of wrong side of the beige cardstock label. 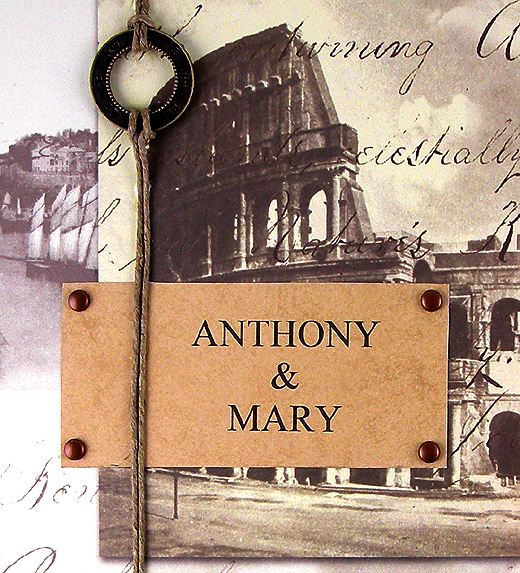 Attach the label centered between the right edge of the burlap strip and top and bottom edges of the page. Punch holes in the corners of the name label and insert the bronze brads to secure it to the page. Cut an 8 inch piece of the hemp string. Fold it in half and feed through the brass medallion, threading the ends though the looped part of the string to tie it to the medallion. Cut a 20 inch piece of the string and repeat the process on opposite side of the medallion. Apply glue to the wrong side of the medallion and attach it about 2 inches from the top edge of the page and so the string tails are centered between the left edge of the name label and the printed name as shown above. Apply a thin line of glue under each of the string tails to secure it to the page. 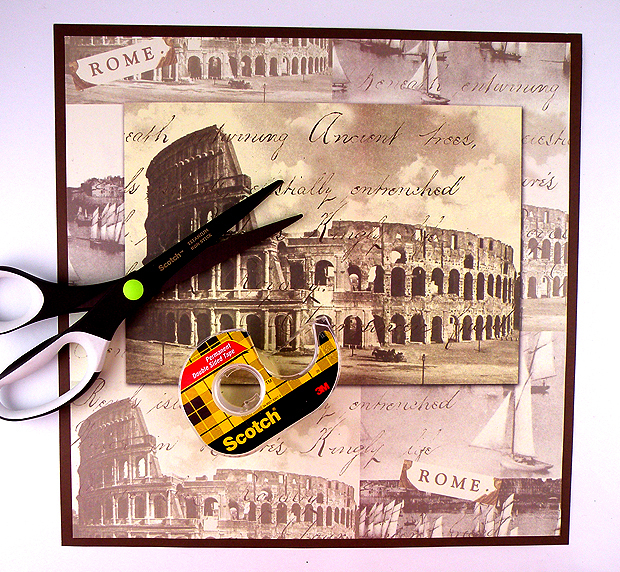 Trim any excess that extends beyond the scrapbooking paper to finish the page. 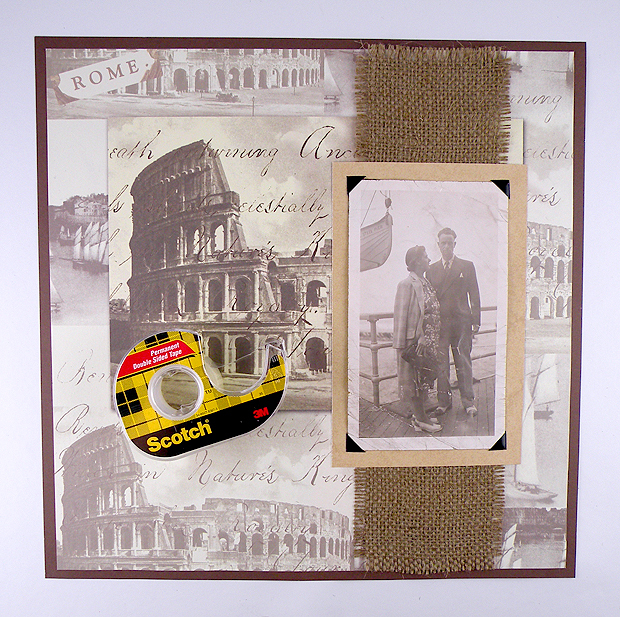 This entry was posted in Crafts, Everything and tagged burlap, craft glue, double-sided tape, Gina Tepper, Italy, old world design, Scotch Brand, Scrapbooking, scrapbooking paper. Bookmark the permalink.